Scent and colour last longer as they are not in the paper that they come wrapped in. Less soap is wasted as you take smaller pieces into the shower. It's easier to mix and match and use a bit of one soap and a bit of another without too much being wasted or the soap going icky. ALWAYS, mark faintly on the soap so you have a guide on where you want to make your cuts. I tend to cut my soaps on a disposable plate, but you can cut them on pretty much anything. Just make sure it's not something you need to keep clean as there may be some wax transfer. Do not pause as you're cutting, make the cut in one smooth movement. 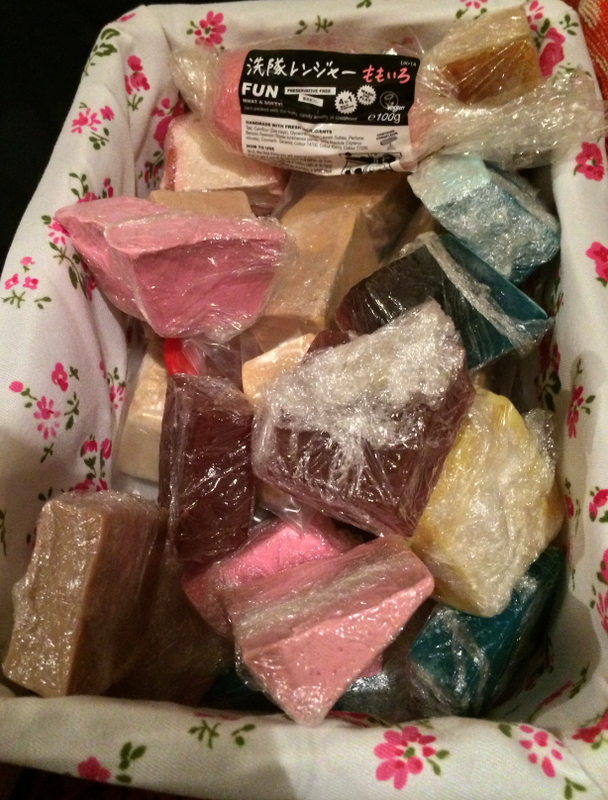 Wrap your soaps in cling film once you have cut them, they keep their scent and colour well like this and they are easier to store (see photo above). Don't worry too much, it's really not hard at all. You can also cut bubble bars. They are fairly easy to cut. I would not recommend cutting bath bombs, I tried to cut a Father Christmas one once and ended up with a powdery mess.